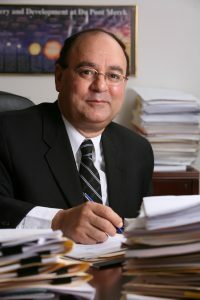 Dr. Mousa was appointed as an endowed, tenured Professor and Executive Vice President and Chairman of the Pharmaceutical Research Institute (PRI) in 2002. He also served as Vice Provost for Research at Albany College of Pharmacy and Health Sciences from 2010 – 2018. As the leader of PRI, Dr. Mousa works with scientists and students to identify novel strategies for unmet medical needs. Dr. Mousa and his staff have developed partnerships with other academic research centers in New York State’s Capital Region and academic and industrial centers nationally and worldwide. He holds Adjunct Professor appointments at Rensselaer Polytechnic Institute, SUNY Albany, SUNY Buffalo, and Temple University. He is a Visiting Professor of Bioethics at Albany Medical College and a Visiting Scholar at Johns Hopkins University. Previously, Dr. Mousa was a Senior Scientist and Fellow at DuPont Pharmaceutical Company for 17 years where he served as a Working Group Chair of several drug discovery programs from 1993-2001. Dr. Mousa holds more than 350 US and International Patents related to the discovery of novel anti-angiogenesis strategies, antithrombotics, anti-integrins, anti-cancer, and non-invasive diagnostic imaging approaches. He has published more than 500 journal articles, book chapters, and books as author and editor. His research has focused on diagnostics and therapeutics of angiogenesis-related disorders, thrombosis, and vascular diseases. Dr. Mousa received his BSC from Alexandria University, College of Pharmacy & Pharmaceutical Sciences with distinction, ranking first in a class of more than 500 Pharmacy students. He was then appointed a member of the faculty, and he received his MSC in Biochemical Pharmacology. He received his PhD from Ohio State University, College of Medicine, in Columbus, OH, and did a Postdoctoral Fellowship at the University of Kentucky, Lexington. He has also received his MBA (Management) from Widener University in Chester, PA.